The backyard has quickly become our playground. It is in most cases an extension of our home. 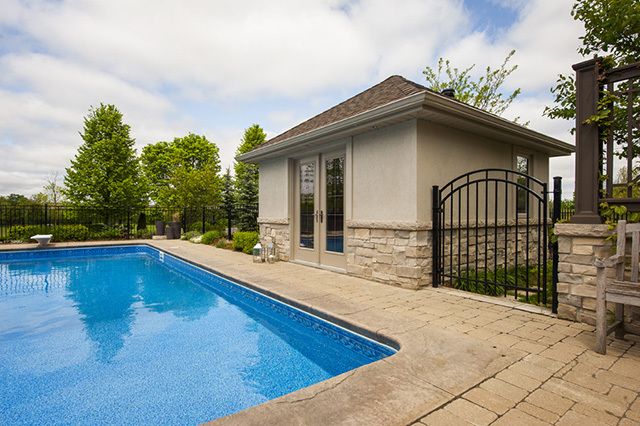 With large over-hangs, patios, entertainment spaces filled with BBQ island’s, built in kitchens, Flat screen TV’s, we’ve even seen pool tables set up in the backyard. Let’s not over look one item made famous in the 50’s and making a huge resurgence in the backyard. The Cabana. Places like Vegas, Napa, Palm Springs, any beach resort and hotels everywhere are building these spaces out as additional rooms near the pool. 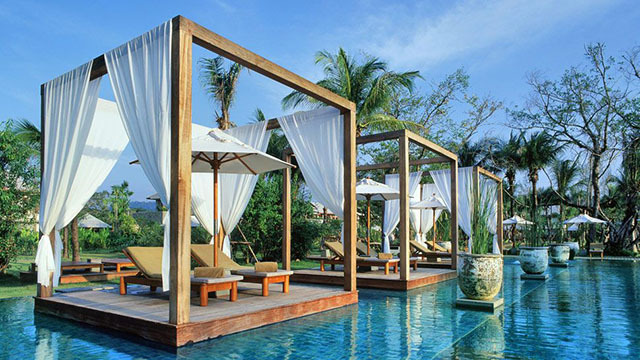 With this in mind we thought we would share some of our favorite Cabana’s we found out and about. This is one of our favorites. We love the boxed seating area, curtains make you feel cool even when it’s hot. Each of these creates a feeling of privacy and yet open space. Love the individual umbrella and really really love how each unit sits on the water. What an awesome place for refuge from the blistering sun. Fully hard covered yet open on the side this space offers both shade and comfort. 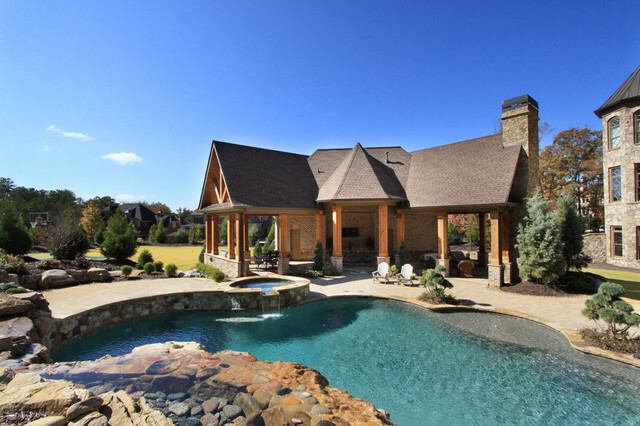 Throw in a natural gad fire pit in the center and you are ready for some intimate entertaining. 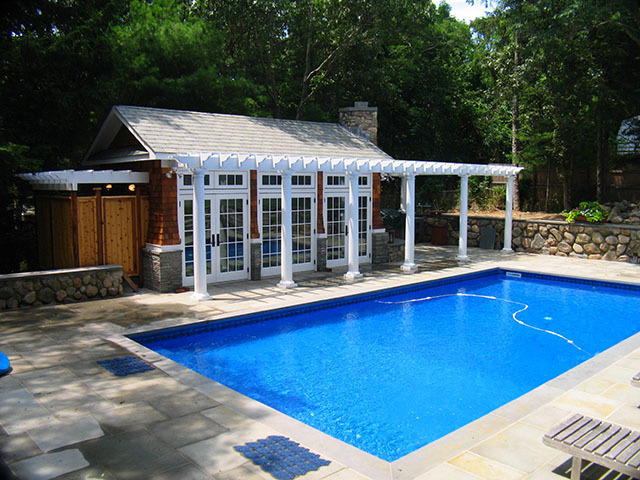 Straight outta Martha’s Vineyard this pool cabana offer full enclosure for both warmth and most likely kitchen amenities, TV, couch, and a place to shower afterwards. The Shingle sided, white framed windows and white pergola design gives this beauty it’s Cape Cod Charm. This little gem is in the backyard of one of our pool customers homes in Marin. You can’t see the magnificent views of the City and the San Francisco Bay in this photo but they are there. Here you have the marriage of three living spaces right at your pool steps. To the right, is a bathroom facility for showing and well, you know… The middle area offers open space relaxing, with a cocktail or two and to the left you find a full blown bedroom for guests to sleep in and enjoy. 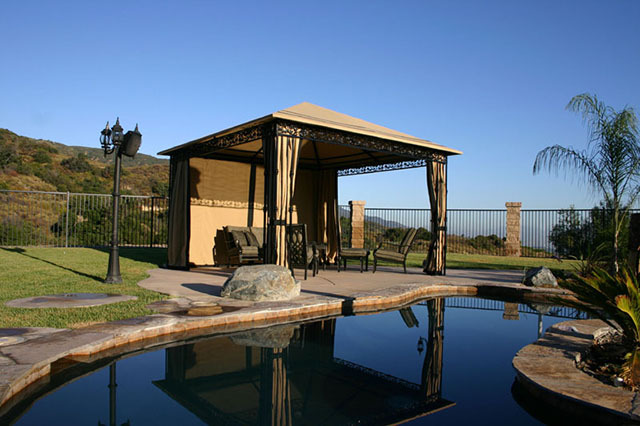 All you need here are a few horseman, some armor and a jousting arena and this Cabana would fit right in. The mini castle looking home you can barely see in the right side of the photo is a good match for this Cabana. Offering lots of covered space, fully enclosed bathroom, entertaining game room and a outdoor Flat screen TV. You have no doubtfully seen a small Cabana like this at the apartments you once lived in. It’s a great room for hosting birthday parties, club events, or just a big family get together. Inside you will find a fully functional kitchen, sink, gas stove and BBQ. Plenty of cold storage for the beverages as well. 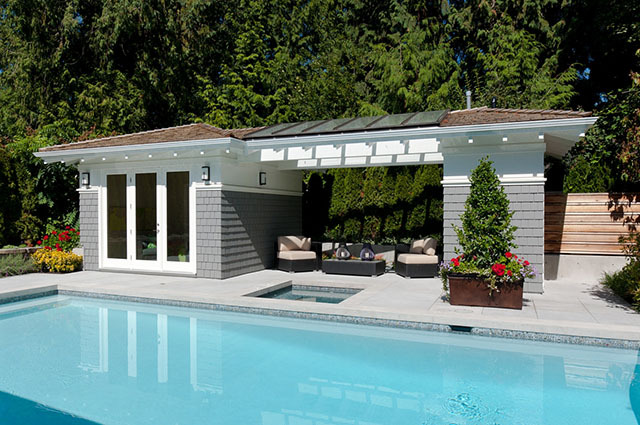 This is a dream Cabana for the in-laws. When the mother you can’t stand comes and visits you treat her like a queen and give her this amazing water front guest house. Private bedroom, living space with TV, Kitchenette, and private bath. The exterior living space is shared y all and makes a conversation area. Yes we know that Hacienda is Spanish and Cabana is Cuban. But does this not look like a mini Hacienda? 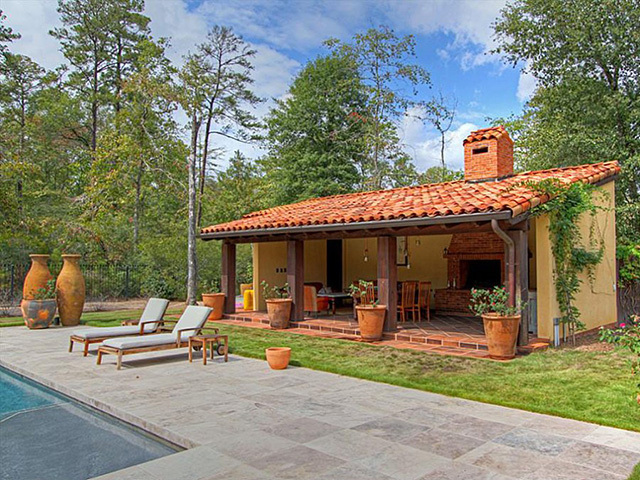 We love the Spanish influence here and it works well with any Mediterranean design. Check out the giant real wood burning fireplace. Plenty of room for the Fat screen TV to go in, a private bath and yes room to hang out. There you have it! 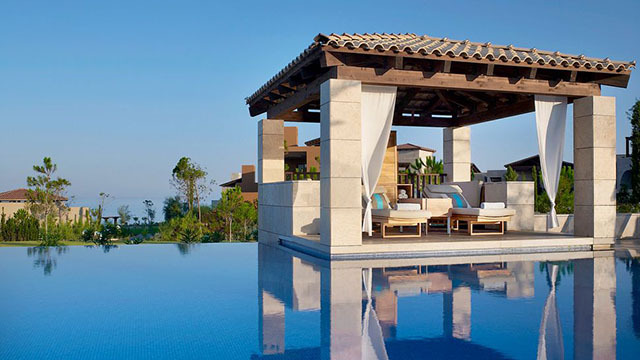 9 of the most inspiring Cabanas we could find. We hope you enjoyed these snap shots of fun and we hoe it inspires you to get out, enjoy the outdoors more and if you do own a pool. Make it special. 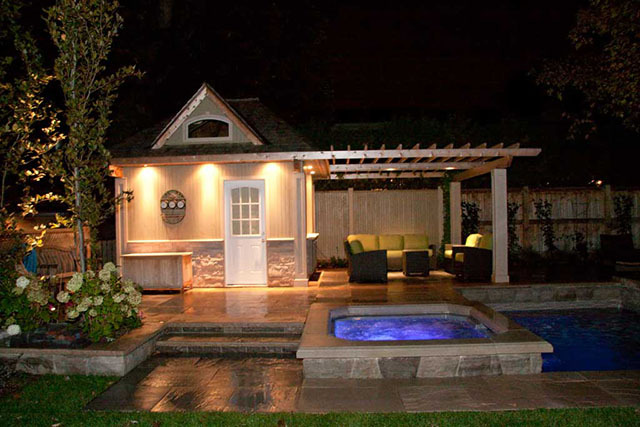 It’s never to late to add a Cabana. If you have a Cabana why not share it with on our Facebook page or post it here on our blog. Have an awesome day!